We always make our own sauce for the pizza - you can find the dough recipe here. This way we know exactly what's in the sauce and we can tailor it to suit. It's a really easy sauce to make, and you can use it for other dishes like a base for the spaghetti sauce. Chop up the capers and anchovies until they are fine and make a paste. In a small saucepan over low-medium heat, add the capers, anchovies, garlic and chilli, along with some olive oil or anchovy oil. Stir until it all starts to reduce. Add tomato paste, sugar and fresh herbs. Add water to make a sauce. Bring to boil - set aside until needed. Cashing in on the Dough - Bellissimo! There's nothing quite like home made pizza dough - light, fluffy, and delicious - forget about the store bought cardboard - make your own!! We have experimented with heaps of different doughs - we started making dough when we had a bread machine - one hour later, and not enough dough quickly changed that idea - it just didn't cope and I was spending hours just making dough. Mix dry ingredients, add water and oil. Knead on floured surface until dough is soft and pliable. Divide equally into 8 portions of 200g each. Place on tray - use baking paper or sprinkle the bottom of the tray with flour or semolina to stop sticking - and cover with a clean tea towel in warm draft free space until dough rises (about 20 mins depending on room temperature). Roll out your dough portions - sprinkle some semolina flour on your workspace before rolling. The semolina will stop the pizza sticking from the tray - be generous with the semolina on the bottom of the pizza, it does not affect flavour and is a blessing when it comes to sliding off the tray. Put your rolled out dough onto the tray. Spread a spoonful of sauce over the pizza base. Sprinkle with a cheese mixture (I use 50/50 cheddar and mozzarella cheeses). Then put your toppings on top with a very light sprinkle of cheese if needed (most do not need more cheese. We roll out all our dough first, then we spoon sauce over them all (to make sure evenly shared among pizzas), then we do cheese on them all. Once that has been done, then we do the toppings. Bake hot oven until crisp on base and cheese has melted (about 15 mins). Freeze: yes. When we freeze the bases, we also put on the sauce and cheese. We freeze on the tray, and once frozen then we wrap (and free up the tray). My Ultimate Tips on Storing Mince - You're Welcome!! I buy in bulk - wherever is the cheapest at the time - check the use by dates if its prepackaged - mince can be temperamental if its really close to its use by date. divide it up - we freeze it in portions of about 250g - this is enough for spaghetti, nachos, etc for 4 people. Get a vacuum sealer machine - if you don't want to go to the expense (it's worth it) - then there is a trick you can use with an iron (if you hate ironing clothes, you might like ironing food???). If you don't want to go to any effort at all, use freezer bags or zip lock bags (large). Roll out your mince to about 2-3mm thick - spreading it into the corners of the bag so that you can eliminate the air easier. If you don't have a rolling pin, use a flat sided drinking glass. Freeze - make sure it's flat in the freezer! this will save you space. If you are just using freezer bags, place some paper towel or newspaper between each layer of mince to stop it all sticking together - this only seems to happen with the thinner plastic bags. To defrost, either take out a few hours before you need it and defrost in the fridge; or if you are in a hurry put the frozen mince (inside the bag) in the sink with some cold (not hot) water while you prep the rest of your meal. A couple of days before, I had seen a post on Facebook for Mexican chicken - it was a post shared from My Litter by a friend - the photo belongs to My Litter, I have modified the recipe as some things are not available in Australia. This was the start of my inspiration. In either an oven proof dish, pressure cooker, or crock pot - put the whole chicken breasts in the bottom of the pot. Drain off the corn kernels and add. Drain and rinse off the black beans and also add to the pot. Add the cream cheese, burrito mix, the chilli and chop up the tomatoes as well - all these go into the pot - don't worry about mixing it, just pop it all in. If you are cooking it in the pressure cooker - I cooked it on 2 curry cycles (about 22 minutes per cycle). 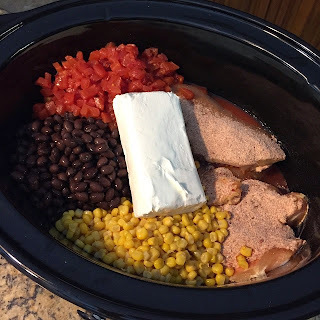 If you are cooking it in the slow cooker you need 4 hours on high, or 6 hours on low. In the oven, make sure its covered and bake on about 160deg for 4-6 hours (keep an eye on it). By far, the pressure cooker is the most energy efficient and fastest way (great if you work long hours). Once its cooked, you will not only smell it, but the chicken will just shred with a fork when you mix it all around. By now, your Mexican chicken will be just about ready. Remove from heat and stir with a fork to shred the chicken - if the chicken totally falls apart - its ready! Refrigerate half of the mixture for another meal (based on serving 3 people). Serve with tortillas, sour cream and cheese - make your own tortillas, its so easy - mix plain flour, water and a dash of olive oil to make a dough, knead until smooth, rest for 10 mins, then roll out very finely - pan fry gently in some oil and serve (yes, I think I just saved you about $6 in tortillas alone). You can take this dish one step further over two nights - only use half of the cooked amount of mixture above - for the second dish, reheat and serve with steamed rice. Its been a long long time since I've made dukkah - freshly made, dished up with some olive oil and balsamic reduction, crusty bread and a glass of wine....just the way I like it. So very easy to make - keeps in an airtight container - not only can you use it as a dipper, but also on top of salads, roasts, steak, vegetables....delicious. Heat the nuts up in a pan (or in the oven) - if they are hazelnuts, you will need to rub off the skins when they cool. Toast sesame seeds in pan until golden - remove from pan (watch these as they will toast very quickly. Toast up the herbs and salt until fragrant - remove from pan. Process the nuts in a food processor (or do it by hand with a knife) until finely chopped. This is an absolute budget breaker - we were down to our last scrappy vegetables and 6 chicken legs - you know what guys are like - "what? I only get 2 legs?" - well, make it go further and cook up a heap of vegetables with it - you will not only finish cleaning out your fridge, but this is a super "cheep" meal (pardon the pun). Even if some of those veges are looking a little tired, you can still use them in this dish. Rub the drumsticks with seasoning and leave overnight to marinate. Chop up vegetables so they are about the same size. In a large baking dish, place all ingredients. Drizzle with olive oil and fresh herbs. Chop up butter and place around dish. Bake 180deg for about 1.5 hours. Note: you can use any vegetables you have which need to be used up for this dish. Putting it together tonight, I had my doubts that 6 drumsticks would be enough for the 3 of us, the vegetables and bacon made it go that much further. If adding beans, add for the last 10-15 minutes only. Don't throw away the juices from the pan, drizzle them over the meal when plating up. Ok, so this doesn't just have to be for lamb - it could be for beef, pork or chicken too - simply mix the ingredients and then rub all over the meat - let it rest - overnight is better for more flavours - then grill, roast, fry - whatever takes your fancy.